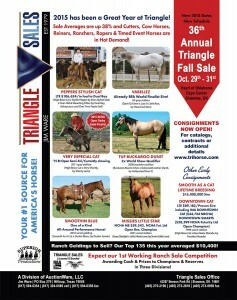 Triangle Fall Sale October 29-31, we are still taking consignments click here! Shawnee, Okla. – The upcoming Triangle Sales fall horse sale, Oct. 29-31, will introduce a new schedule of events and some first-ever opportunities for buyers at the long-established Heart of Oklahoma Expo Center sale site in Shawnee, Okla. Pre-sale competitions will be a new inclusion introduced at the fall sale, as well as a new annual sale schedule, which will now feature three sales during the year rather than five. On Thursday, the 29th, versatility ranch, team roping and barrel racing horses consigned in sales the following days will have the opportunity to compete for cash and prizes, while providing potential buyers an up-close sample of talent. The schedule will begin with a judged competition of versatility ranch horses performing in American Quarter Horse Association (AQHA) ranch riding and ranch cow work. Champions and reserves will be awarded in each division as well as in all-around competition. The versatility ranch horse competition will be followed by a timed competition for team roping and barrel racing horses. All of the competitions will be held in the Fred Humphrey Pavilion on the sale grounds Thursday morning, Oct. 29. The fall sale also marks the beginning of a new sale schedule that restructures some previous Triangle sale dates to create a modified calendar with fewer sales. The result will be the upcoming October sale, followed by 2016 sales in the winter, Jan. 21-23; spring, March 17-19 and fall, Oct. 27-29. Jim Ware, Weatherford, Texas, purchased Triangle Sales Company in October 2014 and headed-up his first sale there in January. Ware was a founding partner in the highly successful sale company, Western Bloodstock and now owns Triangle Sales as part of his company, AuctionWare, LLC. Ware says he is excited about the upcoming changes and what they can bring to buyers and consignors. A weanling sale session is another new change debuting in the October sale, and is sure to offer buyers the best of all-around performance prospects. “That’s a good time to market and sell them before winter,” Ware says. For more details regarding each sale session go to trihorse.com. Overall sale averages have increased at Triangle Sales by 38-percent for the year. Since purchasing Triangle Sales Company, Ware has implemented “click to bid” Internet purchasing through Superior Productions, fall-of-hammer insurance with Markel Insurance and shorter sale days. The October sale will feature horses from a range of disciplines, reflective of the trademark offering known to Triangle Sales throughout its 36-year history. This is a characteristic Ware says he enjoys and will strive to maintain. For more information on upcoming sales click here.